Gardeners Tamara and Ed animating the space with some fun drawings of the garden. Wow- what an evening! We had the pleasure of celebrating the inaugural season of the beautiful Riley Park Community Garden- thanks to the Little Mountain Neighbourhood House for hosting our large turnout. There were snowflake decorations, incredible food provided by Chickpea, apple cider pressed in the garden and fermented by gardener Robin, and much more. Read on! 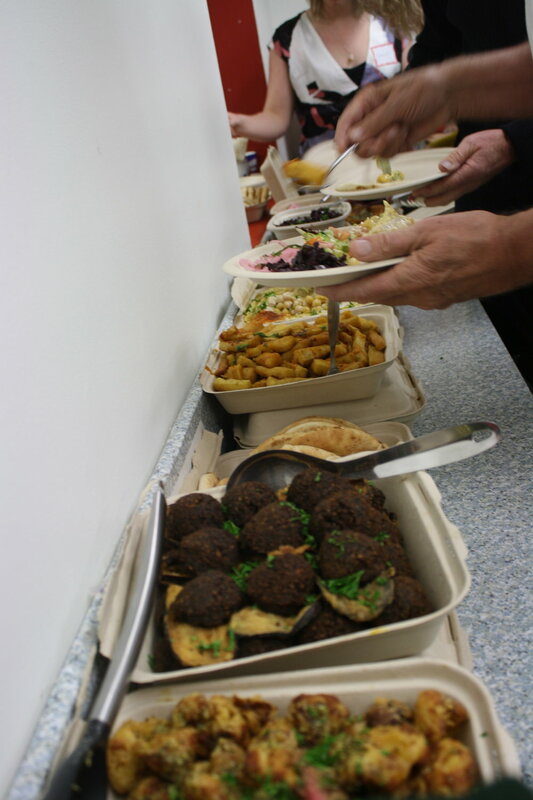 Delicious vegan middle eastern food enjoyed by all- thanks Chickpea! A line of hungry and happy volunteers with Joanne MacKinnon at the helm! Happy volunteers Lloyd and Felicia enjoying the meal. Some festive apple cider bottled by Rob. MC for the evening and project manager Joanne MacKinnon started off the event proceedings acknowledging key volunteers and introducing Lori Snyder, who spoke in relation to our garden and its connection to First Nation communities. Lori Snyder speaking to the volunteers. Then we had a presentation of a slideshow made by Erika, which featured highlights from the 2017 season- and will posted to this website soon! We also heard from Art and Allan about "Riley Park through the Ages". This project has required a lot of work and is ongoing- so stay tuned where to see more of this topic! Art and Allan in front of their project. We also heard from Len who discussed our Shed project, which will be an opportunity for our community to gather even closer. For the rest of the evening, volunteers contributed to the ongoing "Riley Park storybook" spearheaded by Anya- a visual scrapbook of memories drawn/written/put together in all shapes and forms representing the 2017 season. Guests were also encouraged to share feedback by way of post-it notes on the walls responding to certain questions pertaining to the garden and their experience. An example of a contribution to the 2017 storybook, done by volunteer Susan. Thank you so much for everyone's hard work this season. Make sure to check the calendar for more events happening through the winter!